Who said you can’t trust lawyers? You can certainly trust SwedelsonGottlieb, as we are actively opposing proposed new legislation that would make us more money, AB 1738. This bill concerning internal dispute resolution (IDR) in common interest developments (Civil Code Sections 5900-5920) was recently passed by the the California State Assembly and the Senate unopposed. It’s clear that the legislators do not understand the implications of what may happen if this legislation is signed into law by the Governor. If signed into law, this new law will most certainly make more work for us community association attorneys, as owners will be bringing their attorneys to IDR meetings, and many boards will opt to do the same. Because IDR is not a mediation, but a meeting with at least one member of the board, what is said at that meeting is not subject to the confidentiality requirements that cover the ADR process. AB 1738 would seemingly allow any comment made during the IDR meeting, and any document utilized in that process, to likely be admissible in future litigation. This means that any private, inadvertent, casual, or inaccurate statements made during IDR could become a problem for the association. We need to convince the Governor that AB 1738 is neither warranted nor sensible and should be vetoed, as it will harm both members and HOAs. IDR is meant to be an informal, cost-effective way to resolve disputes, without attorneys. IDR was introduced into the Davis-Stirling Act because an owner claimed that they were unable to meet with members of their board to discuss their issues; under current law, if an association receives an IDR demand, the board, at the minimum, is required to have at least one board member meet with that owner to discuss and attempt to resolve their issues. Currently, we advise our association clients participating in IDR with an owner to close and terminate any IDR meeting with the owner if the owner unexpectedly brings an attorney to the IDR meeting. Most boards rightfully do not want to meet with an owner and their attorney if the board does not have their legal counsel present. It just is not fair under most circumstances to have a board meeting with an attorney unless the association is likewise represented. If the board feels that it wants to meet with the owner and their attorney, the association can be sure to also have its association attorney present at an rescheduled IDR meeting. Or the board can advise the owner that the board is willing to meet with them, but without attorneys present. AB 1738 would revise the Civil Code to specifically allow an attorney to attend IDR to assist an owner. This would call into question the association’s ability to terminate the IDR meeting in order to ensure its attorney could also attend and provide an even playing field. If anything, we would have liked to have seen a ban on attorneys attending or being an active part of the IDR meeting or process. 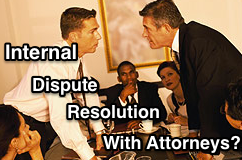 If IDR doesn’t result in a resolution of the issue, attorneys can always get involved in the required alternative dispute resolution (ADR) process, which is required before filing a lawsuit. So, please help make sure you don’t have to hire SwedelsonGottlieb to attend every IDR meeting with your owners. Contact Governor Brown as soon as possible to ensure this bill does not get signed into law. • Enter your information, and select “AB 1738” from the drop-down menu (you’ll have to scroll down quite a bit). • Click “Con” and paste the below text (or your own) into your message. • Share your email with others, and ask them to oppose AB 1738. I live and am on the Board of my HOA (or, I am a manager at or for a California homeowners association; or I work with California homeowners associations). California law allows for Internal Dispute Resolution (IDR) and provides a no-cost way for owners and boards of directors to settle differences in community associations. AB 1738 increases the cost by encouraging owners to have their lawyers attend the IDR meeting, and this would then mean their association would have to do the same so there is a level field. California law also allows for Alternative Dispute Resolution (ADR) of disputes at community associations, and that is where owners can have their attorneys present. We need to keep IDR internal, informal and low cost. We do not need to make IDR an ADR. IDR is not a mediation, and therefore does not have the same confidentiality requirements. AB 1738 encourages lawyer participation without providing confidentiality protection. This means anything said in IDR can be used against the association in any subsequent litigation. AB 1738 legislation is harmful to homeowners, as it will undoubtedly increase the association’s costs and thus the assessments each owner is required to pay. And there is nothing to show that this cost is warranted, or more importantly, that owners need their attorney to attend an IDR meeting. For all of these reasons, I ask that you veto AB 1738.